The gold standard, as an international institution, existed for less than 40 years, emerging first, and by accident, in England, and more than a century and a half later, spreading by a rapid series of independent, but interrelated, decisions to the United States, Germany, and most of Europe and much of the rest of the world. After its collapse with the outbreak of World War I, reconstruction of the gold standard was thought by many to be a precondition for recreating the stable and prosperous international order that had been brutally demolished by the Great War. But that attempt ended catastrophically when the restoration of the gold standard was subverted by the insane gold-accumulation policy of the Bank of France and the failure of the Federal Reserve and other national monetary authorities to heed the explicit warnings of two of the leading monetary theorists of immediate postwar era, R. G. Hawtrey and Gustav Cassel, that unless the monetary demand for gold was kept from increasing as a result of the resumption of convertibility, a renewed gold standard could trigger a disastrous deflation. But despite its short, checkered, and not altogether happy, history as an international institution, the gold standard, in its idealized and largely imagined form has retained a kind of nostalgic aura of stability, excellence and grandeur, becoming an idiom for anything that’s the best of its kind. So no, Virginia, there is no Santa Claus, and the gold standard is not the gold standard of monetary systems. My own impression is that most, though not all, supporters of the gold standard are smitten by a kind of romantic, unthinking, and irrational attachment to the idea that the gold standard is a magic formula for recovering a lost golden age. But having said that, I would also add that I actually think that the gold standard, in its brief first run as an international monetary system, did not perform all that badly, and I can even sympathize with the ultimately unsuccessful attempt to restore the gold standard after World War I. I just think that the risks of scrapping our current monetary arrangements and trying to replace them with a gold standard recreated from scratch, over a century after it ceased to function effectively in practice, are far too great to consider it seriously as a practical option. Not long ago I was chided by Larry White for being unduly harsh in my criticism of the gold standard in my talk at the Mercatus Center conference on Monetary Rules for a Post-Crisis World. I responded to Larry in this post. But I now find myself somewhat exasperated by a post by Stephen Cecchetti and Kermit Schoenholtz on the blog they maintain for their money and banking textbook. I don’t know much about Schoenholtz, but Cecchetti is an economist of the first rank. They clearly share my opposition to gold standard, but I’m afraid that some of their arguments against the gold standard are misguided or misconceived. I don’t write this post just to be critical; it’s only because their arguments reflect common and long-standing misconceptions and misunderstandings that have become part of the received doctrine about the gold standard that those arguments are worth taking the time and effort to criticize. So let’s start from the beginning of their post, which is actually quite a good beginning. They quote Barry Eichengreen, one of our most eminent economic historians. “Far from being synonymous with stability, the gold standard itself was the principal threat to financial stability and economic prosperity between the wars.” Barry Eichengreen, Golden Fetters. That’s certainly true, but notice that the quotation from Eichengreen explicitly refers to the interwar period; it’s not a blanket indictment. After quoting Eichengreen, Cecchetti and Schoenholtz refer to a lecture delivered by Ben Bernanke when he was still Chairman of the Federal Reserve Board. Quoting this lecture is not a good sign, because back in 2012 after Bernanke gave the lecture, I wrote a post in which I explained why Bernanke had failed to provide a coherent criticism of the gold standard. When the central bank fixes the dollar price of gold, rather than the price of goods we consume, fluctuations in the dollar price of goods replace fluctuations in the market price of gold. Since prices are tied to the amount of money in the economy, which is linked to the supply of gold, inflation depends on the rate that gold is mined. When the gold standard is used at home and abroad, it is an exchange rate policy in which international transactions must be settled in gold. Digging gold out of one hole in the ground (a mine) to put it into another hole in the ground (a vault) wastes resources. Bernanke’s first statement is certainly correct, but his second statement ignores the fact that the amount of new gold extracted from the earth in a year is only a small fraction of the existing stock of gold. Thus, fluctuations in the value of gold are more likely to be caused by fluctuations in the demand for gold than by fluctuations in supply. The third statement makes as much sense as saying that since the US economy operates on a dollar standard transactions must be settled in hard currency. In fact, the vast majority of legal transactions are settled not by the exchange of currency but by the exchange of abstract claims to currency. There is no reason why, under a gold standard, international transactions could not be settled by abstract claims to gold rather than in physical gold. I agree with the fourth statement. Consistent with Bernanke’s critique, the evidence shows that both inflation and economic growth were quite volatile under the gold standard. The following chart plots annual U.S. consumer price inflation from 1880, the beginning of the post-Civil War gold standard, to 2015. The vertical blue line marks 1933, the end of the gold standard in the United States. The standard deviation of inflation during the 53 years of the gold standard is nearly twice what it has been since the collapse of the Bretton Woods system in 1973 (denoted in the chart by the vertical red line). That is, even if we include the Great Inflation of the 1970s, inflation over the past 43 years has been more stable than it was under the gold standard. Focusing on the most recent quarter century, the interval when central banks have focused most intently on price stability, then the standard deviation of inflation is less than one-fifth of what it was during the gold standard epoch. Source: Federal Reserve Bank of Minneapolis. I am sorry to say this, but comparing the average rate and the variability of inflation under the gold standard (1880-1933) and under a pure dollar standard (1973-2016) is tendentious and misleading, because the 20-year period from 1914 to 1933, a period marked by rapid wartime and post-war inflation and two post-war deflations, was a period when the gold standard either was not functioning at all (1914 to about 1922) or was being unsuccessfully reconstructed. Now it would be one thing to conclude from the failed attempt at reconstruction that a second attempt at reconstruction would be futile and potentially as disastrous as the first attempt, but that doesn’t seem to be what Ceccheti and Schoenholz are arguing. Instead, they include data from 20 years when the gold standard was either not operating at all or was operating dysfunctionally to make an unqualified comparison between the performance of the US economy under the gold standard and under a pure dollar standard. That simplistic comparison conveys almost no useful information. A fairer comparison would be between the gold standard as it operated between 1880 and 1914 and either the dollar standard of the post-Bretton Woods era (1973 – 2016) or the period from 1991 to 2016 when, according to Cecchetti and Schoenholz, the Fed adopted an explicit or implicit inflation target as its primary policy objective. Changing the gold-standard period in this way reduces the average inflation rate from 0.86% to 0.23% a year and the standard deviation from 5.06% to 2.13%. That comparison is not obviously disadvantageous to the gold standard. What about economic growth? Again, the gold standard was associated with greater volatility, not less. The following chart plots annual growth as measured by gross national product (gross domestic product only came into common use in the 1991.) The pattern looks quite a bit like that of inflation: the standard deviation of economic growth during the gold-standard era was more than twice that of the period since 1973. And, despite the Great Recession, the past quarter century has been even more stable. To use another, simpler, measure, in the period from 1880 to 1933 there were 15 business cycles identified by the National Bureau of Economic Research. That is, on average there was a recession once every 3½ years. By contrast, since 1972, there have been 7 recessions; one every 6 years. Again, this comparison, like the inflation comparison is distorted by the exogenous disruption associated with World War I and its aftermath. Excluding the 1914 to 1933 period from the comparison would make for a far less one-sided comparison than the one presented by Cecchetti and Schoenholtz. Finally, consider a crude measure of financial stability: the frequency of banking crises. From 1880 to 1933, there were at least 5 full-fledged banking panics: 1893, 1907, 1930, 1931, and 1933. Including the savings and loan crisis of the 1980s, in the past half century, there have been two. But if we exclude the Great Depression period from the comparison, there were two banking panics under the gold standard and two under the dollar standard. So the performance of the gold standard when it was operating normally was not clearly inferior to the operation of the dollar standard. So, on every score, the gold standard period was less stable. Prices were less stable; growth was less stable; and the financial system was less stable. Why? We see six major reasons. First, the gold standard is procyclical. When the economy booms, inflation typically rises. In the absence of a central bank to force the nominal interest rate up, the real interest rate falls, providing a further impetus to activity. In contrast, countercyclical monetary policy—whether based on a Taylor rule or not—would lean against the boom. I don’t know what the basis is for the factual assertion that high growth under a gold standard is associated with inflation. There were periods of high growth with very low or negative inflation under the gold standard. Periods of mild inflation, owing to a falling real value of gold, perhaps following significant discoveries of previously unknown gold deposits, may have had a marginal stimulative effect under the gold standard, but such episodes were not necessarily periods of economic instability. At any rate it is not even clear why, if a countericyclical monetary policy were desirable, such a policy could not be conducted under the gold standard by a central bank constrained by an obligation to convert its liabilities into gold on demand. Some gold standard proponents, like Larry White for example, insist that a gold standard could and would function better without a central bank than with a central bank. I am skeptical about that position, but even if it is correct, there is nothing inherent in the idea of a gold standard that is inconsistent with the existence of a central bank that conducts a countercyclical policy, so I don’t understand why Cecchetti and Schoenholtz assert, without argument, that a central bank could not conduct a countercyclical policy under a gold standard. Second, the gold standard has exchange rate implications. While we do not know for sure, we suspect that current U.S. advocates of a shift to gold are thinking of the case where the United States acts alone (rather than waiting to coordinate a global return to the gold standard). If so, the change would impose unnecessary risks on exporters and importers, their employees and their creditors. To see why, consider the consequences of a move in the global price of gold measured in some other currency, say British pounds. If the pound price of gold changed, but the dollar price of gold did not, the result would be a move in the real dollar-pound exchange rate. That is, unless the dollar prices of U.S. goods and the dollar wages of U.S. workers adjust instantly to offset gold price fluctuations, the real dollar exchange rate changes. In either case, the result would almost surely induce volatility of production, employment, and the debt burden. If the US monetary policy were governed by a commitment to convert the dollar into gold at a fixed conversion rate, the dollar price of gold would remain constant and exchange rates of the dollar in terms of the pound and other non-gold currencies would fluctuate. We have fluctuating exchange rates now against the pound and other currencies. It is not clear to me why exchange rates would be more volatile under this system than they are currently. More broadly, a gold standard suffers from some of the same problems as any fixed-exchange rate system. Not only can’t the exchange rate adjust to buffer external shocks, but the commitment invites speculative attacks because it lacks time consistency. Under a gold standard, the scale of the central bank’s liabilities—currency plus reserves—is determined by the gold it has in its vault. Imagine that, as a consequence of an extended downturn, people come to fear a currency devaluation. That is, they worry that the central bank will raise the dollar price of gold. In such a circumstance, it will be natural for investors to take their dollars to the central bank and exchange them for gold. The doubts that motivate such a run can be self-fulfilling: once the central bank starts to lose gold reserves, it can quickly be compelled to raise its dollar price, or to suspend redemption entirely. This is what happened in 1931 to the Bank of England, when it was driven off the gold standard. It happened again in 1992 (albeit with foreign currency reserves rather than gold) when Britain was compelled to abandon its fixed exchange rate. Cecchetti and Schoenholtz articulate a valid concern, and it is a risk inherent in any gold standard or any monetary system based on trust in a redemption commitment. My only quibble is that Cecchetti and Schoenholtz overrate the importance of gold reserves. Foreign-exchange reserves would do just as well, and perhaps better, than gold reserves, because, unlike gold, foreign-exchange reserves yield interest. Third, as historians have emphasized, the gold standard helped spread the Great Depression from the United States to the rest of the world. The gold standard was a global arrangement that formed the basis for a virtually universal fixed-exchange rate regime in which international transactions were settled in gold. Here Cecchetti and Schoenholtz stumble into several interrelated confusions. First, while the gold standard was certainly an international transmission mechanism, the international linkage between national price levels being an essential characteristic of the gold standard, there is no reason to identify the United States as the source of a disturbance that was propagated to the rest of the world. Because the value of gold must be equalized in all countries operating under the gold standard, changes in the value of gold are an international, not a national, phenomenon. Thus, an increase in the demand for gold causing an increase in its value would have essentially the same effects on the world economy irrespective of the geographic location of the increase in the demand for gold. In the 1920s, the goal of reestablishing the gold standard meant restoring convertibility of the leading currencies into gold, so that price levels in all gold standard countries, all reflecting the internationally determined value of gold, were closely aligned. This meant that a country with an external deficit — one whose imports exceed its exports — was required to pay the difference by transferring gold to countries with external surpluses. The loss of gold forced the deficit country’s central bank to shrink its balance sheet, reducing the quantity of money and credit in the economy, and driving domestic prices down. Put differently, under a gold standard, countries running external deficits face deflationary pressure. A surplus country’s central bank faced no such pressure, as it could choose whether to convert higher gold stocks into money or not. Put another way, a central bank can have too little gold, but it can never have too much. Cecchetti and Schonholtz are confusing two distinct questions: a) what determines the common international value of gold? and b) what accounts for second-order deviations between national price levels? The important point is that movements in national price levels under the gold standard were highly correlated because, owing to international arbitrage of tradable goods, the value of gold could not differ substantially between countries on the gold standard. Significant short-run changes in the value of gold had to reflect changes in the total demand for gold because short-run changes in the supply of gold are only a small fraction of the existing stock. To be sure, short-run differences in inflation across countries might reflect special circumstances causing over- or under-valuation of particular currencies relative to one another, but those differences were of a second-order magnitude relative to the sharp worldwide deflation that characterized the Great Depression in which the price levels of all gold-standard countries fell simultaneously. It is always the case that some countries will be running trade deficits and some will be running trade surpluses. At most, that circmstance might explain small differences in relative rates of inflation or deflation across countries; it can’t explain why deflation was rampant across all countries at the same time. The shock that produced the Great Depression was a shock to the real value of gold which was caused mainly by the gold accumulation policy of the Bank of France. However, the United States, holding about 40 percent of the world’s monetary gold reserves after World War I, could have offset or mitigated the French policy by allowing an outflow of some of its massive gold reserves. Instead, the Fed, in late 1928, raised interest rates yet again to counter what it viewed as unhealthy stock-market speculation, thereby intensifying, rather than mitigating, the deflationary effect of the gold-accumulation policy of the Bank of France. Implicitly, Cecchetti and Schoenholtz assume that the observed gold flows were the result of non-monetary causes, which is to say that gold flows were the result of trade imbalances reflecting purely structural factors, such as national differences in rates of productivity growth, or propensities to save, or demand and supply patterns, over which central banks have little or no influence. But in fact, central banks and monetary authorities based their policies on explicit or implicit goals for their holdings of gold reserves. And the value of gold ultimately reflected the combined effect of the policy decisions taken by all central banks thereby causing a substantial increase in the demand of national monetary authorities to hold gold. This policy asymmetry helped transmit financial shocks in the United States abroad. By the late 1920s, the major economies had restored the pre-World War I gold standard. At the time, both the United States and France were running external surpluses, absorbing the world’s gold into their central bank vaults. Cecchetti and Schoneholtz say explicitly “the United States and France were running external surpluses, absorbing the world’s gold into their central bank vaults” as if those surpluses just happened and were unrelated to the monetary policies deliberately adopted by the Bank of France and the Federal Reserve. But, instead of allowing the gold inflows to expand the quantity of money in their financial systems, authorities in both countries tightened monetary policy to resist booming asset prices and other signs of overheating. The result was catastrophic, compelling deficit countries with gold outflows to tighten their monetary policies even more. As the quantity of money available worldwide shrank, so did the price level, adding to the real burden of debt, and prompting defaults and bank failures virtually around the world. Cecchetti and Schoenholtz have the causation backwards; it was the tightness of monetary policy that caused gold inflows into France and later into the United States. The gold flows did not precede, but were the result of, already tight monetary policies. Cecchetti and Schoenholtz are implicitly adopting the sterilization model based on the price-specie-flow mechanism in which it is gold flows that cause, or ought to cause, changes in the quantity of money. I debunked the simplistic sterilization idea in this post. But, in fairness, I should acknowledge that Cecchetti and Schoenholz do eventually acknowledge that the demand by central banks to hold gold reserves is what determines actual monetary policy under the gold standard. But despite that acknowledgment, they can’t free themselves from the misconception that it was a reduction in the quantity of money, rather than an increase in the demand for gold, that caused the value of gold to rise in the Great Depression. Fourth, economists blame the gold standard for sustaining and deepening the Great Depression. What makes this view most compelling is the fact that the sooner a country left the gold standard and regained discretionary control of its monetary policy, the faster it recovered. The contrast between Sweden and France is striking. Sweden left gold in 1931, and by 1936 its industrial production was 14 percent higher than its 1929 level. France waited until 1936 to leave, at which point its industrial production was fully 26 percent below the level just 7 years earlier (see here and here.) Similarly, when the U.S. suspended gold convertibility in March 1933—allowing the dollar to depreciate substantially—the financial and economic impact was immediate: deflation turned to inflation, lowering the real interest rate, boosting asset prices, and triggering one of the most powerful U.S. cyclical upturns (see, for example, Romer). This is certainly right. My only quibble is that Cecchetti and Schoenholtz do not acknowledge that the Depression was triggered by a rapid increase in the international demand for gold by the world’s central banks in 1928-29, in particular the Bank of France and the Federal Reserve. Turning to financial stability, the gold standard limits one of the most powerful tools for halting bank panics: the central bank’s authority to act as lender of last resort. It was the absence of this function during the Panic of 1907 that was the primary impetus for the creation of the Federal Reserve System. Yet, under a gold standard, the availability of gold limits the scope for expanding central bank liabilities. Thus, had the Fed been on a strict gold standard in the fall of 2008—when Lehman failed—the constraint on its ability to lend could again have led to a collapse of the financial system and a second Great Depression. At best, the charge that the gold standard limits the capacity of a central bank to act as a lender of last resort is a serious oversimplification. The ability of a central bank to expand its liabilities is not limited by the gold standard in any way. What limits the ability of the central bank to expand its liabilities are gold-cover requirements such as those enacted by the Bank Charter Act of 1844 which imposed a 100% marginal reserve requirement on the issue of banknotes by the Bank of England beyond a fixed fiduciary issue requiring no gold cover. Subsequent financial crises in 1847, 1857, and 1866 were quelled as soon as the government suspended the relevant provisions of the Bank Charter Act, allowing the Bank of England to increase its note issue and satisfy the exceptional demands for liquidity that led to the crisis in the first place. Finally, because the supply of gold is finite, the quantity available to the central bank likely will grow more slowly than the real economy. As a result, over long periods—say, a decade or more—we would expect deflation. While (in theory) labor, debt and other contracts can be arranged so that the economy will adjust smoothly to steady, long-term deflation, recent experience (including that with negative nominal interest rates) makes us skeptical. Whether gold appreciates over the long-term depends on the rate at which the quantity of gold expands over time and the rate of growth of demand for gold over time. It is plausible to expect secular deflation under the gold standard, but it is hardly inevitable. I don’t think that we yet fully understand the conditions under which secular deflation is compatible with full employment. Certainly if we were confident that secular deflation is compatible with full employment, the case for secular deflation would be very compelling. This brings us back to where we started. Under a gold standard, inflation, growth and the financial system are all less stable. There are more recessions, larger swings in cons umer prices and more banking crises. When things go wrong in one part of the world, the distress will be transmitted more quickly and completely to others. In short, re-creating a gold standard would be a colossal mistake. These conclusions are based on very limited historical experience, and it is not clear how relevant that experience is for contemporary circumstances. The argument against a gold standard not so much that a gold standard could not in principle operate smoothly and efficiently. It is that, a real gold standard having been abandoned for 80 years, recreating a gold standard would be radical and risky undertaking completely lacking in a plausible roadmap for its execution. The other argument against the gold standard is that insofar as gold would be actually used as a medium of exchange in a recreated gold standard with a modern banking system, the banking system would be subject to the potentially catastrophic risk of a flight to quality in periods of banking instability, leading to a disastrous deflationary increase in the value of gold. A little over three months ago on a brutally hot day in Washington DC, I gave a talk about a not yet completed paper at the Mercatus Center Conference on Monetary Rules for a Post-Crisis World. The title of my paper was (and still is) “Rules versus Discretion Historically Contemplated.” I hope to post a draft of the paper soon on SSRN. One of the attendees at the conference was Larry White who started his graduate training at UCLA just after I had left. When I wrote a post about my talk, Larry responded with a post of his own in which he took issue with some of what I had to say about the gold standard, which I described as the first formal attempt at a legislated monetary rule. Actually, in my talk and my paper, my intention was not as much to criticize the gold standard as it was to criticize the idea, which originated after the gold standard had already been adopted in England, of imposing a fixed numerical rule in addition to the gold standard to control the quantity of banknotes or the total stock of money. The fixed mechanical rule was imposed by an act of Parliament, the Bank Charter Act of 1844. The rule, intended to avoid financial crises such as those experienced in 1825 and 1836, actually led to further crises in 1847, 1857 and 1866 and the latter crises were quelled only after the British government suspended those provisions of the Act preventing the Bank of England from increasing the quantity of banknotes in circulation. So my first point was that the fixed quantitative rule made the gold standard less stable than it would otherwise have been. My second point was that, in the depths of the Great Depression, a fixed rule freezing the nominal quantity of money was proposed as an alternative rule to the gold standard. It was this rule that one of its originators, Henry Simons, had in mind when he introduced his famous distinction between rules and discretion. Simons had many other reasons for opposing the gold standard, but he introduced the famous rules-discretion dichotomy as a way of convincing those supporters of the gold standard who considered it a necessary bulwark against comprehensive government control over the economy to recognize that his fixed quantity rule would be a far more effective barrier than the gold standard against arbitrary government meddling and intervention in the private sector, because the gold standard, far from constraining the conduct of central banks, granted them broad discretionary authority. The gold standard was an ineffective rule, because it specified only the target pursued by the monetary authority, but not the means of achieving the target. In Simons view, giving the monetary authority to exercise discretion over the instruments used to achieve its target granted the monetary authority far too much discretion for independent unconstrained decision making. My third point was that Henry Simons himself recognized that the strict quantity rule that he would have liked to introduce could only be made operational effectively if the entire financial system were radically restructured, an outcome that he reluctantly concluded was unattainable. However, his student Milton Friedman convinced himself that a variant of the Simons rule could actually be implemented quite easily, and he therefore argued over the course of almost his entire career that opponents of discretion ought to favor the quantity rule that he favored instead of continuing to support a restoration of the gold standard. However, Friedman was badly mistaken in assuming that his modified quantity rule eliminated discretion in the manner that Simons had wanted, because his quantity rule was defined in terms of a magnitude, the total money stock in the hands of the public, which was a target, not, as he insisted, an instrument, the quantity of money held by the public being dependent on choices made by the public, not just on choices made by the monetary authority. So my criticism of quantity rules can be read as at least a partial defense of the gold standard against the attacks of those who criticized the gold standard for being insufficiently rigorous in controlling the conduct of central banks. Let me now respond to some of Larry’s specific comments and criticisms of my post. [Glasner] suggests that perhaps the earliest monetary rule, in the general sense of a binding pre-commitment for a money issuer, can be seen in the redemption obligations attached to banknotes. The obligation was contractual: A typical banknote pledged that the bank “will pay the bearer on demand” in specie. . . . He rightly remarks that “convertibility was not originally undertaken as a policy rule; it was undertaken simply as a business expedient” without which the public would not have accepted demand deposits or banknotes. I wouldn’t characterize the contract in quite the way Glasner does, however, as a “monetary rule to govern the operation of a monetary system.” In a system with many banks of issue, the redemption contract on any one bank’s notes was a commitment from that bank to the holders of those notes only, without anyone intending it as a device to govern the operation of the entire system. The commitment that governs a single bank ipso facto governs an entire monetary system only when that single bank is a central bank, the only bank allowed to issue currency and the repository of the gold reserves of ordinary commercial banks. It’s hard to write a short description of a system that covers all possible permutations in the system. While I think Larry is correct in noting the difference between the commitment made by any single bank to convert – on demand — its obligations into gold and the legal commitment imposed on an entire system to maintain convertibility into gold, the historical process was rather complicated, because both silver and gold coins circulating in Britain. So the historical fact that British banks were making their obligations convertible into gold was the result of prior decisions that had been made about the legal exchange rate between gold and silver coins, decisions which overvalued gold and undervalued silver, causing full bodied silver coins to disappear from circulation. Given a monetary framework shaped by the legal gold/silver parity established by the British mint, it was inevitable that British banks operating within that framework would make their banknotes convertible into gold not silver. I agree that introducing a central bank into the picture creates the possibility that the actions of the central bank will have a destabilizing effect. But that does not necessarily mean that the actions of the central bank could not also have a stabilizing effect compared to how a pure free-banking system would operate under a gold standard. As the author of Free Banking and Monetary Reform, Glasner of course knows the distinction well. So I am not here telling him anything he doesn’t know. I am only alerting readers to keep the distinction in mind when they hear or read “the gold standard” being blamed for financial instability. I wish that Glasner had made it more explicit that he is talking about a system run by the Bank of England, not the more automatic type of gold standard with free banking. But in my book, I did acknowledge that there inherent instabilities associated with a gold standard. That’s why I proposed a system that would aim at stabilizing the average wage level. Almost thirty years on, I have to admit to having my doubts whether that would be the right target to aim for. And those doubts make me more skeptical than I once was about adopting any rigid monetary rule. When it comes to monetary rules, I fear that the best is the enemy of the good. However, the widely held expectations that the restoration of convertibility of banknotes issued by the Bank of England into gold would produce a stable monetary regime and a stable economy were quickly disappointed, financial crises and depressions occurring in 1825 and again in 1836. Left unexplained is why the expectations were disappointed, why the monetary regime remained unstable. A reader who hasn’t read Glasner’s other blog entries on the gold standard might think that he is blaming the gold standard as such. Actually I didn’t mean to blame anyone for the crises of 1825 and 1836. All I meant to do was a) blame the Currency School for agitating for a strict quantitative rule governing the total quantity of banknotes in circulation to be imposed on top of the gold standard, b) point out that the rule that was enacted when Parliament passed the Bank Charter Act of 1844 failed to prevent subsequent crises in 1847, 1857 and 1866, and c) that the crises ended only after the provisions of the Bank Charter Act limiting the issue of banknotes by the Bank of England had been suspended. My own view is that, because the monopoly Bank of England’s monopoly was not broken up, even with convertibility acting as a long-run constraint, the Bank had the power to create cyclical monetary instability and occasionally did so by (unintentionally) over-issuing and then having to contract suddenly as gold flowed out of its vault — as happened in 1825 and again in 1836. Because the London note-issue was not decentralized, the Bank of England did not experience prompt loss of reserves to rival banks (adverse clearings) as soon as it over-issued. Regulation via the price-specie-flow mechanism (external drain) allowed over-issue to persist longer and grow larger. Correction came only with a delay, and came more harshly than continuous intra-London correction through adverse clearings would have. Bank of England mistakes boggled the entire financial system. It was central bank errors and not the gold standard that disrupted monetary stability after 1821. Here, I think, we do arrive at a basic theoretical disagreement, because I don’t accept that the price-specie-flow mechanism played any significant role in the international adjustment process. National price levels under the gold standard were positively correlated to a high degree, not negatively correlated, as implied by the price-specie-flow mechanism. Moreover, the Bank Charter Act imposed a fixed quantitative limit on the note issue of all British banks and the Bank of England in particular, so the overissue of banknotes by the Bank of England could not have been the cause of the post-1844 financial crises. If there was excessive credit expansion, it was happening through deposit creation by a great number of competing deposit-creating banks, not the overissue of banknotes by the Bank of England. This hypothesis about the source of England’s cyclical instability is far from original with me. It was offered during the 1821-1850 period by a number of writers. Some, like Robert Torrens, were members of the Currency School and offered the Currency Principle as a remedy. Others, like James William Gilbart, are better classified as members of the Free Banking School because they argued that competition and adverse clearings would effectively constrain the Bank of England once rival note issuers were allowed in London. Although they offered different remedies, these writers shared the judgment that the Bank of England had over-issued, stimulating an unsustainable boom, then was eventually forced by gold reserve losses to reverse course, instituting a credit crunch. Because Glasner elides the distinction between free banking and central banking in his talk and blog post, he naturally omits the third side in the Currency School-Banking School-Free Banking School debate. And my view is that Free Bankers like Larry White overestimate the importance of note issue in a banking system in which deposits were rapidly overtaking banknotes as the primary means by which banks extended credit. As Henry Simons, himself, recognized this shift from banknotes to bank deposits was itself stimulated, at least in part, by the Bank Charter Act, which made the extension of credit via banknotes prohibitively costly relative to expansion by deposit creation. Given the convertibility commitment, the actual quantity of the monetary instrument that is issued is whatever quantity the public wishes to hold. That, at any rate, was the theory of the gold standard. There were — and are – at least two basic problems with that theory. First, making the value of money equal to the value of gold does not imply that the value of money will be stable unless the value of gold is stable, and there is no necessary reason why the value of gold should be stable. Second, the behavior of a banking system may be such that the banking system will itself destabilize the value of gold, e.g., in periods of distress when the public loses confidence in the solvency of banks and banks simultaneously increase their demands for gold. The resulting increase in the monetary demand for gold drives up the value of gold, triggering a vicious cycle in which the attempt by each to increase his own liquidity impairs the solvency of all. 1 While it is true that the purchasing power of gold was not perfectly stable under the classical gold standard, perfection is not the relevant benchmark. The purchasing power of money was more stable under the classical gold standard than it has been under fiat money standards since the Second World War. Average inflation rates were closer to zero, and the price level was more predictable at medium to long horizons. Whatever Glasner may have meant by “necessary reason,” there certainly is a theoretical reason for this performance: the economics of gold mining make the purchasing power of gold (ppg) mean-reverting in the face of monetary demand and supply shocks. An unusually high ppg encourages additional gold mining, until the ppg declines to the normal long-run value determined by the flow supply and demand for gold. An unusually low ppg discourages mining, until the normal long-run ppg is restored. It is true that permanent changes in the gold mining cost conditions can have a permanent impact on the long-run level of the ppg, but empirically such shocks were smaller than the money supply variations that central banks have produced. 2 The behavior of the banking system is indeed critically important for short-run stability. Instability wasn’t a problem in all countries, so we need to ask why some banking systems were unstable or panic-prone, while others were stable. The US banking system was panic prone in the late 19th century while the Canadian system was not. The English system was panic-prone while the Scottish system was not. The behavioral differences were not random or mere facts of nature, but grew directly from differences in the legal restrictions constraining the banks. The Canadian and Scottish systems, unlike the US and English systems, allowed their banks to adequately diversify, and to respond to peak currency demands, thus allowed banks to be more solvent and more liquid, and thus avoided loss of confidence in the banks. The problem in the US and England was not the gold standard, or a flaw in “the theory of the gold standard,” but ill-conceived legal restrictions that weakened the banking systems. Larry makes two good points, but I doubt that they are very important in practice. The problem with the value of gold is that there is a very long time lag before the adjustment in the rate of output of new gold will cause the value of gold to revert back to its normal level. The annual output of gold is only about 3 percent of the total stock of gold. If the monetary demand for gold is large relative to the total stock and that demand is unstable, the swing in the overall demand for gold can easily dominate the small resulting change in the annual rate of output. So I do not have much confidence that the mean-reversion characteristic of the purchasing power of gold to be of much help in the short or even the medium term. I also agree with Larry that the Canadian and Scottish banking systems exhibited a lot more stability than the neighboring US and English banking systems. That is an important point, but I don’t think it is decisive. It’s true that there were no bank failures in Canada in the Great Depression. But the absence of bank failures, while certainly a great benefit, did not prevent Canada from suffering a downturn of about the same depth and duration as the US did between 1929 and 1933. The main cause of the Great Depression was the deflation caused by the appreciation of the value of gold. The deflation caused bank failures when banks were small and unstable and did not cause bank failures when banks were large and diversified. But the deflation was still wreaking havoc on the rest of the economy even though banks weren’t failing. What’s so Bad about the Gold Standard? Last week Paul Krugman argued that Ted Cruz is more dangerous than Donald Trump, because Trump is merely a protectionist while Cruz wants to restore the gold standard. I’m not going to weigh in on the relative merits of Cruz and Trump, but I have previously suggested that Krugman may be too dismissive of the possibility that the Smoot-Hawley tariff did indeed play a significant, though certainly secondary, role in the Great Depression. In warning about the danger of a return to the gold standard, Krugman is certainly right that the gold standard was and could again be profoundly destabilizing to the world economy, but I don’t think he did such a good job of explaining why, largely because, like Ben Bernanke and, I am afraid, most other economists, Krugman isn’t totally clear on how the gold standard really worked. [P]rotectionism didn’t cause the Great Depression. It was a consequence, not a cause – and much less severe in countries that had the good sense to leave the gold standard. That’s basically right. But I note for the record, to spell out the my point made in the post I alluded to in the opening paragraph that protectionism might indeed have played a role in exacerbating the Great Depression, making it harder for Germany and other indebted countries to pay off their debts by making it more difficult for them to exports required to discharge their obligations, thereby making their IOUs, widely held by European and American banks, worthless or nearly so, undermining the solvency of many of those banks. It also increased the demand for the gold required to discharge debts, adding to the deflationary forces that had been unleashed by the Bank of France and the Fed, thereby triggering the debt-deflation mechanism described by Irving Fisher in his famous article. Which brings us to Cruz, who is enthusiastic about the gold standard – which did play a major role in spreading the Depression. Well, that’s half — or maybe a quarter — right. The gold standard did play a major role in spreading the Depression. But the role was not just major; it was dominant. And the role of the gold standard in the Great Depression was not just to spread it; the role was, as Hawtrey and Cassel warned a decade before it happened, to cause it. The causal mechanism was that in restoring the gold standard, the various central banks linking their currencies to gold would increase their demands for gold reserves so substantially that the value of gold would rise back to its value before World War I, which was about double what it was after the war. It was to avoid such a catastrophic increase in the value of gold that Hawtrey drafted the resolutions adopted at the 1922 Genoa monetary conference calling for central-bank cooperation to minimize the increase in the monetary demand for gold associated with restoring the gold standard. Unfortunately, when France officially restored the gold standard in 1928, it went on a gold-buying spree, joined in by the Fed in 1929 when it raised interest rates to suppress Wall Street stock speculation. The huge accumulation of gold by France and the US in 1929 led directly to the deflation that started in the second half of 1929, which continued unabated till 1933. The Great Depression was caused by a 50% increase in the value of gold that was the direct result of the restoration of the gold standard. In principle, if the Genoa Resolutions had been followed, the restoration of the gold standard could have been accomplished with no increase in the value of gold. But, obviously, the gold standard was a catastrophe waiting to happen. Worse, relying on gold can easily have the effect of forcing a tightening of monetary policy at precisely the wrong moment. In a crisis, people get worried about banks and seek cash, increasing the demand for the monetary base – but you can’t expand the monetary base to meet this demand, because it’s tied to gold. But Krugman is being a little sloppy here. If the demand for the monetary base – meaning, presumably, currency plus reserves at the central bank — is increasing, then the public simply wants to increase their holdings of currency, not spend the added holdings. So what stops the the central bank accommodate that demand? Krugman says that “it” – meaning, presumably, the monetary base – is tied to gold. What does it mean for the monetary base to be “tied” to gold? Under the gold standard, the “tie” to gold is a promise to convert the monetary base, on demand, at a specified conversion rate. Question: why would that promise to convert have prevented the central bank from increasing the monetary base? Answer: it would not and did not. Since, by assumption, the public is demanding more currency to hold, there is no reason why the central bank could not safely accommodate that demand. Of course, there would be a problem if the public feared that the central bank might not continue to honor its convertibility commitment and that the price of gold would rise. Then there would be an internal drain on the central bank’s gold reserves. But that is not — or doesn’t seem to be — the case that Krugman has in mind. Rather, what he seems to mean is that the quantity of base money is limited by a reserve ratio between the gold reserves held by the central bank and the monetary base. But if the tie between the monetary base and gold that Krugman is referring to is a legal reserve requirement, then he is confusing the legal reserve requirement with the gold standard, and the two are simply not the same, it being entirely possible, and actually desirable, for the gold standard to function with no legal reserve requirement – certainly not a marginal reserve requirement. On top of that, a slump drives interest rates down, increasing the demand for real assets perceived as safe — like gold — which is why gold prices rose after the 2008 crisis. But if you’re on a gold standard, nominal gold prices can’t rise; the only way real prices can rise is a fall in the prices of everything else. Hello, deflation! Note the implicit assumption here: that the slump just happens for some unknown reason. I don’t deny that such events are possible, but in the context of this discussion about the gold standard and its destabilizing properties, the historically relevant scenario is when the slump occurred because of a deliberate decision to raise interest rates, as the Fed did in 1929 to suppress stock-market speculation and as the Bank of England did for most of the 1920s, to restore and maintain the prewar sterling parity against the dollar. Under those circumstances, it was the increase in the interest rate set by the central bank that amounted to an increase in the monetary demand for gold which is what caused gold appreciation and deflation. I want to begin this post by saying that I’m flattered by, and grateful to, Frances Coppola for the first line of her blog post yesterday. But – and I note that imitation is the sincerest form of flattery – I fear I have to take issue with her over competitive devaluation. This competitive depreciation is an entirely imaginary danger. The benefit that a country derives from the depreciation of its currency is in the rise of its price level relative to its wage level, and does not depend on its competitive advantage. If other countries depreciate their currencies, its competitive advantage is destroyed, but the advantage of the price level remains both to it and to them. They in turn may carry the depreciation further, and gain a competitive advantage. But this race in depreciation reaches a natural limit when the fall in wages and in the prices of manufactured goods in terms of gold has gone so far in all the countries concerned as to regain the normal relation with the prices of primary products. When that occurs, the depression is over, and industry is everywhere remunerative and fully employed. Any countries that lag behind in the race will suffer from unemployment in their manufacturing industry. But the remedy lies in their own hands; all they have to do is to depreciate their currencies to the extent necessary to make the price level remunerative to their industry. Their tardiness does not benefit their competitors, once these latter are employed up to capacity. Indeed, if the countries that hang back are an important part of the world’s economic system, the result must be to leave the disparity of price levels partly uncorrected, with undesirable consequences to everybody. . . . The highlight “in terms of gold” is mine, because it is the key to why Glasner is wrong. Hawtrey was right in his time, but his thinking does not apply now. We do not value today’s currencies in terms of gold. We value them in terms of each other. And in such a system, competitive devaluation is by definition beggar-my-neighbour. Let me explain. Hawtrey defines currency values in relation to gold, and advertises the benefit of devaluing in relation to gold. The fact that gold is the standard means there is no direct relationship between my currency and yours. I may devalue my currency relative to gold, but you do not have to: my currency will be worth less compared to yours, but if the medium of account is gold, this does not matter since yours will still be worth the same amount in terms of gold. Assuming that the world price of gold remains stable, devaluation therefore principally affects the DOMESTIC price level. As Hawtrey says, there may additionally be some external competitive advantage, but this is not the principal effect and it does not really matter if other countries also devalue. It is adjusting the relationship of domestic wages and prices in terms of gold that matters, since this eventually forces down the price of finished goods and therefore supports domestic demand. Conversely, in a floating fiat currency system such as we have now, if I devalue my currency relative to yours, your currency rises relative to mine. There may be a domestic inflationary effect due to import price rises, but we do not value domestic wages or the prices of finished goods in terms of other currencies, so there can be no relative adjustment of wages to prices such as Hawtrey envisages. Devaluing the currency DOES NOT support domestic demand in a floating fiat currency system. It only rebalances the external position by making imports relatively more expensive and exports relatively cheaper. This difference is crucial. In a gold standard system, devaluing the currency is a monetary adjustment to support domestic demand. In a floating fiat currency system, itis an external adjustment to improve competitiveness relative to other countries. When Great Britain left the gold standard, deflationary measure were everywhere resorted to. Not only did the Bank of England raise its rate, but the tremendous withdrawals of gold from the United States involved an increase of rediscounts and a rise of rates there, and the gold that reached Europe was immobilized or hoarded. . . . The consequence was that the fall in the price level continued. The British price level rose in the first few weeks after the suspension of the gold standard, but then accompanied the gold price level in its downward trend. This fall of prices calls for no other explanation than the deflationary measures which had been imposed. Indeed what does demand explanation is the moderation of the fall, which was on the whole not so steep after September 1931 as before. Yet when the commercial and financial world saw that gold prices were falling rather than sterling prices rising, they evolved the purely empirical conclusion that a depreciation of the pound had no effect in raising the price level, but that it caused the price level in terms of gold and of those currencies in relation to which the pound depreciated to fall. For any such conclusion there was no foundation. Whenever the gold price level tended to fall, the tendency would make itself felt in a fall in the pound concurrently with the fall in commodities. But it would be quite unwarrantable to infer that the fall in the pound was the cause of the fall in commodities. On the other hand, there is no doubt that the depreciation of any currency, by reducing the cost of manufacture in the country concerned in terms of gold, tends to lower the gold prices of manufactured goods. . . . But that is quite a different thing from lowering the price level. For the fall in manufacturing costs results in a greater demand for manufactured goods, and therefore the derivative demand for primary products is increased. While the prices of finished goods fall, the prices of primary products rise. Whether the price level as a whole would rise or fall it is not possible to say a priori, but the tendency is toward correcting the disparity between the price levels of finished products and primary products. That is a step towards equilibrium. And there is on the whole an increase of productive activity. The competition of the country which depreciates its currency will result in some reduction of output from the manufacturing industry of other countries. But this reduction will be less than the increase in the country’s output, for if there were no net increase in the world’s output there would be no fall of prices. Frances identifies an important difference between an international system of fiat currencies in which currency values are determined in relationship to each other in foreign exchange markets and a gold standard in which currency values are determined relative to gold. However, she seems to be suggesting that currency values in a fiat money system affect only the prices of imports and exports. But that can’t be so, because if the prices of imports and exports are affected, then the prices of the goods that compete with imports and exports must also be affected. And if the prices of tradable goods are affected, then the prices of non-tradables will also — though probably with a lag — eventually be affected as well. Of course, insofar as relative prices before the change in currency values were not in equilibrium, one can’t predict that all prices will adjust proportionately after the change. To make the point in more abstract terms, the principle of purchasing power parity (PPP) operates under both a gold standard and a fiat money standard, and one can’t just assume that the gold standard has some special property that allows PPP to hold, while PPP is somehow disabled under a fiat currency system. Absent an explanation of why PPP doesn’t hold in a floating fiat currency system, the assertion that devaluing a currency (i.e., driving down the exchange value of one currency relative to other currencies) “is an external adjustment to improve competitiveness relative to other countries” is baseless. We do not value today’s currencies in terms of gold. We value them in terms of each other. And in such a system, competitive devaluation is by definition beggar-my-neighbour. Unfortunately, Frances falls into the common trap of believing that a definition actually tell us something about the real word, when in fact a definition tell us no more than what meaning is supposed to be attached to a word. The real world is invariant with respect to our definitions; our definitions convey no information about reality. So for Frances to say – apparently with the feeling that she is thereby proving her point – that competitive devaluation is by definition beggar-my-neighbour is completely uninformative about happens in the world; she is merely informing us about how she chooses to define the words she is using. Frances goes on to refer to this graph taken from Gavyn Davies in the Financial Times, concerning a speech made by Stanley Fischer about research done by Fed staff economists showing that the 20% appreciation in the dollar over the past 18 months has reduced the rate of US inflation by as much as 1% and is projected to cause US GDP in three years to be about 3% lower than it would have been without dollar appreciation. Importantly, the impact of the higher exchange rate does not reverse itself, at least in the time horizon of this simulation – it is a permanent hit to the level of GDP, assuming that monetary policy is not eased in the meantime. According to the model, the annual growth rate should have dropped by about 0.5-1.0 per cent by now, and this effect should increase somewhat further by the end of this year. But of course this assumes that the US does not ease monetary policy further. Suppose that it does? The hit to net exports shown on the above graph is caused by imports becoming relatively cheaper and exports relatively more expensive as other countries devalue. If the US eased monetary policy in order to devalue the dollar support nominal GDP, the relative prices of imports and exports would rebalance – to the detriment of those countries attempting to export to the US. They have three choices: they respond with further devaluation of their own currencies to support exports, they impose import tariffs to support their own balance of trade, or they accept the deflationary shock themselves. The first is the feared “competitive devaluation” – exporting deflation to other countries through manipulation of the currency; the second, if widely practised, results in a general contraction of global trade, to everyone’s detriment; and you would think that no government would willingly accept the third. But, as Hawtrey showed, competitive devaluation is not a problem. Depreciating your currency cushions the fall in nominal income and aggregate demand. If aggregate demand is kept stable, then the increased output, income, and employment associated with a falling exchange rate will spill over into a demand for the exports of other countries and an increase in the home demand for exportable home products. So it’s a win-win situation. However, the Fed has permitted passive monetary tightening over the last eighteen months, and in December 2015 embarked on active monetary tightening in the form of interest rate rises. Davies questions the rationale for this, given the extraordinary rise in the dollar REER and the growing evidence that the US economy is weakening. I share his concern. And I share his concern, too. So what are we even arguing about? Equally troubling is how passive tightening has reduced US demand for imports and for US exportable products, so passive tightening has negative indirect effects on aggregate demand in the rest of the world. Although currency depreciation generally tends to increase the home demand for imports and for exportables, there are in fact conditions when the general rule that competitive devaluation is expansionary for all countries may be violated. In a number of previous posts (e.g., this, this, this, this and this) about currency manipulation, I have explained that when currency depreciation is undertaken along with a contractionary monetary policy, the terms-of-trade effect predominates without any countervailing effect on aggregate demand. If a country depreciates its exchange rate by intervening in foreign-exchange markets, buying foreign currencies with its own currency, thereby raising the value of foreign currencies relative to its own currency, it is also increasing the quantity of the domestic currency in the hands of the public. Increasing the quantity of domestic currency tends to raise domestic prices, thereby reversing, though probably with a lag, the effect on the currency’s real exchange rate. To prevent the real-exchange rate from returning to its previous level, the monetary authority must sterilize the issue of domestic currency with which it purchased foreign currencies. This can be done by open-market sales of assets by the cental bank, or by imposing increased reserve requirements on banks, thereby forcing banks to hold the new currency that had been created to depreciate the home currency. This sort of currency manipulation, or exchange-rate protection, as Max Corden referred to it in his classic paper (reprinted here), is very different from conventional currency depreciation brought about by monetary expansion. The combination of currency depreciation and tight money creates an ongoing shortage of cash, so that the desired additional cash balances can be obtained only by way of reduced expenditures and a consequent export surplus. Since World War II, Japan, Germany, Taiwan, South Korea, and China are among the countries that have used currency undervaluation and tight money as a mechanism for exchange-rate protectionism in promoting industrialization. But exchange rate protection is possible not only under a fiat currency system. Currency manipulation was also possible under the gold standard, as happened when the France restored the gold standard in 1928, and pegged the franc to the dollar at a lower exchange rate than the franc had reached prior to the restoration of convertibility. That depreciation was accompanied by increased reserve requirements on French banknotes, providing the Bank of France with a continuing inflow of foreign exchange reserves with which it was able to pursue its insane policy of accumulating gold, thereby precipitating, with a major assist from the high-interest rate policy of the Fed, the deflation that turned into the Great Depression. About a month ago, I started a series of posts about monetary policy in the 1920s, (about the Bank of France, Benjamin Strong, the difference between a gold-exchange standard and a gold standard, and Ludwig von Mises’s unwitting affirmation of the Hawtrey-Cassel explanation of the Great Depression). The series was not planned, each post being written as new ideas occurred to me or as I found interesting tidbits (about Strong and Mises) in reading stuff I was reading about the Bank of France or the gold-exchange standard. Another idea that occurred to me was to look at the 1991 English translation of the memoirs of Emile Moreau, Governor of the Bank of France from 1926 to 1930; I managed to find a used copy for sale on Amazon, which I got in the mail over the weekend. I have only read snatches here and there, by looking up names in the index, and we’ll see when I get around to reading the book from cover to cover. One of the more interesting things about the book is the foreward to the English translation by Milton Friedman (and one by Charles Kindleberger as well) to go along with the preface to the 1954 French edition by Jacques Rueff (about which I may have something to say in a future post — we’ll see about that, too). Friedman’s foreward to Moreau’s memoir is sometimes cited as evidence that he backtracked from his denial in the Monetary History that the Great Depression had been caused by international forces, Friedman insisting that there was actually nothing special about the initial 1929 downturn and that the situation only got out of hand in December 1930 when the Fed foolishly (or maliciously) allowed the Bank of United States to fail, triggering a wave of bank runs and bank failures that caused a sharp decline in the US money stock. According to Friedman it was only at that point that what had been a typical business-cycle downturn degenerated into what Friedman like to call the Great Contraction. Friedman based his claim that domestic US forces, not an international disturbance, had caused the Great Depression on the empirical observation that US gold reserves increased in 1929; that’s called reasoning from a quantity change. From that fact, Friedman inferred that international forces could not have caused the 1929 downturn, because an international disturbance would have meant that the demand for gold would have increased in the international centers associated with the disturbance, in which case gold would have been flowing out of, not into, the US. In a 1985 article in AER, Gertrude Fremling pointed out an obvious problem with Friedman’s argument which was that gold was being produced every year, and some of the newly produced gold was going into the reserves of central banks. An absolute increase in US gold reserves did not necessarily signify a monetary disturbance in the US. In fact, Fremling showed that US gold reserves actually increased proportionately less than total gold reserves. Unfortunately, Fremling failed to point out that there was a flood of gold pouring into France in 1929, making it easier for Friedman to ignore the problem with his misidentification of the US as the source of the Great Depression. With that introduction out of the way, let me now quote Friedman’s 1991 acknowledgment that the Bank of France played some role in causing the Great Depression. I find this minimal adjustment by Friedman of his earlier position in the Monetary History totally unsatisfactory. Why do I find it unsatisfactory? To begin with, Friedman makes vague references to unnamed but “important subtleties” in Moreau’s memoir that he was unable to appreciate before reading the 1991 translation. There was nothing subtle about the gold accumulation being undertaken by the Bank of France; it was massive and relentless. The table below is constructed from data on official holdings of monetary gold reserves from December 1926 to June 1932 provided by Clark Johnson in his important book Gold, France, and the Great Depression, pp. 190-93. In December 1926 France held $711 million in gold or 7.7% of the world total of official gold reserves; in June 1932, French gold holdings were $3.218 billion or 28.4% of the world total. What was it about that policy that Friedman didn’t get? He doesn’t say. What he does say is that he would not alter his previous judgment that the US was responsible “for the initiation of a worldwide contraction.” The only change he would make would be to say that France, as well as the US, contributed to the vulnerability of the international financial system to unspecified disturbances, because of a failure to follow “gold-standard rules.” I will just note that, as I have mentioned many times on this blog, references to alleged “gold standard rules” are generally not only unhelpful, but confusing, because there were never any rules as such to the gold standard, and what are termed “gold-standard rules” are largely based on a misconception, derived from the price-specie-flow fallacy, of how the gold standard actually worked. My goal in this post was not to engage in more Friedman bashing. What I wanted to do was to clarify the underlying causes of Friedman’s misunderstanding of what caused the Great Depression. But I have to admit that sometimes Friedman makes it hard not to engage in Friedman bashing. So let’s examine another passage from Friedman’s foreward, and see where that takes us. Another feature of Moreau’s book that is most fascinating . . . is the story it tells of the changing relations between the French and British central banks. At the beginning, with France in desperate straits seeking to stabilize its currency, [Montagu] Norman [Governor of the Bank of England] was contemptuous of France and regarded it as very much of a junior partner. Through the accident that the French currency was revalued at a level that stimulated gold imports, France started to accumulate gold reserves and sterling reserves and gradually came into the position where at any time Moreau could have forced the British off gold by withdrawing the funds he had on deposit at the Bank of England. The result was that Norman changed from being a proud boss and very much the senior partner to being almost a supplicant at the mercy of Moreau. What’s wrong with this passage? Well, Friedman was correct about the change in the relative positions of Norman and Moreau from 1926 to 1928, but to say that it was an accident that the French currency was revalued at a level that stimulated gold imports is completely — and in this case embarrassingly — wrong, and wrong in two different senses: one strictly factual, and the other theoretical. First, and most obviously, the level at which the French franc was stabilized — 125 francs per pound — was hardly an accident. Indeed, it was precisely the choice of the rate at which to stabilize the franc that was a central point of Moreau’s narrative in his memoir, a central drama of the tale told by Moreau, more central than the relationship between Norman and Moreau, being the struggle between Moreau and his boss, the French Premier, Raymond Poincaré, over whether the franc would be stabilized at that rate, the rate insisted upon by Moreau, or the prewar parity of 25 francs per pound. So inquiring minds can’t help but wonder what exactly did Friedman think he was reading? The second sense in which Friedman’s statement was wrong is that the amount of gold that France was importing depended on a lot more than just its exchange rate; it was also a function of a) the monetary policy chosen by the Bank of France, which determined the total foreign-exchange holdings held by the Bank of France, and b) the portfolio decisions of the Bank of France about how, given the exchange rate of the franc and given the monetary policy it adopted, the resulting quantity of foreign-exchange reserves would be held. The importance of personality is strikingly revealed by the contrast between Harding’s behavior and that of Emile Moreau in France under much more difficult circumstances. Moreau formally had no independence whatsoever from the central government. He was named by the premier, and could be discharged at any time by the premier. But when he was asked by the premier to provide the treasury with funds in a manner that he considered inappropriate and undesirable, he flatly refused to do so. Of course, what happened was that Moreau was not discharged, that he did not do what the premier had asked him to, and that stabilization was rather more successful. Now, if you didn’t read this passage carefully, in particular the part about Moreau’s threat to resign, as I did not the first three or four times that I read it, you might not have noticed what a peculiar description Friedman gives of the incident in which Moreau threatened to resign following a request “by the premier to provide the treasury with funds in a manner that he considered inappropriate and undesirable.” That sounds like a very strange request for the premier to make to the Governor of the Bank of France. The Bank of France doesn’t just “provide funds” to the Treasury. What exactly was the request? And what exactly was “inappropriate and undesirable” about that request? The page for May 30, 1928, on which Mr. Moreau set out the problem of legal stabilization, is an admirable lesson in financial wisdom and political courage. I reproduce it here in its entirety with the hope that it will be constantly present in the minds of those who will be obliged in the future to cope with French monetary problems. “The word drama may sound surprising when it is applied to an event which was inevitable, given the financial and monetary recovery achieved in the past two years. Since July 1926 a balanced budget has been assured, the National Treasury has achieved a surplus and the cleaning up of the balance sheet of the Bank of France has been completed. The April 1928 elections have confirmed the triumph of Mr. Poincaré and the wisdom of the ideas which he represents. The political situation has been stabilized. Under such conditions there is nothing more natural than to stabilize the currency, which has in fact already been pegged at the same level for the last eighteen months. “But things are not quite that simple. The 1926-28 recovery from restored confidence to those who had actually begun to give up hope for their country and its capacity to recover from the dark hours of July 1926. . . . perhaps too much confidence. “Distinguished minds maintained that it was possible to return the franc to its prewar parity, in the same way as was done with the pound sterling. And how tempting it would be to thereby cancel the effects of the war and postwar periods and to pay back in the same currency those who had lent the state funds which for them often represented an entire lifetime of unremitting labor. “International speculation seemed to prove them right, because it kept changing its dollars and pounds for francs, hoping that the franc would be finally revalued. “Raymond Poincaré, who was honesty itself and who, unlike most politicians, was truly devoted to the public interest and the glory of France, did, deep in his heart, agree with those awaiting a revaluation. “But I myself had to play the ungrateful role of representative of the technicians who knew that after the financial bloodletting of the past years it was impossible to regain the original parity of the franc. “I was aware, as had already been determined by the Committee of Experts in 1926, that it was impossible to revalue the franc beyond certain limits without subjecting the national economy to a particularly painful readaptation. If we were to sacrifice the vital force of the nation to its acquired wealth, we would put at risk the recovery we had already accomplished. We would be, in effect, preparing a counterspeculation against our currency that would come within a rather short time. “Since the parity of 125 francs to one pound has held for long months and the national economy seems to have adapted itself to it, it should be at this rate that we stabilize without further delay. So what this tells me is that the very act of personal strength that so impressed Friedman about Moreau was not about some imaginary “inappropriate” request made by Poincaré (“who was honesty itself”) for the Bank to provide funds to the treasury, but about whether the franc should be stabilized at 125 francs per pound, a peg that Friedman asserts was “accidental.” Obviously, it was not “accidental” at all, but it was based on the judgment of Moreau and his advisers (including two economists of considerable repute, Charles Rist and his student Pierre Quesnay) as attested to by Rueff in his preface, of which we know that Friedman was aware. Just to avoid misunderstanding, I would just say here that I am not suggesting that Friedman was intentionally misrepresenting any facts. I think that he was just being very sloppy in assuming that the facts actually were what he rather cluelessly imagined them to be. Benjamin Strong and Emile Moreau were admirable characters of personal force and integrity. But in my view, the common policies they followed were misguided and contributed to the severity and rapidity of transmission of the U.S. shock to the international community. We stressed that the U.S. “did not permit the inflow of gold to expand the U.S. money stock. We not only sterilized it, we went much further. Our money stock moved perversely, going down as the gold stock went up” from 1929 to 1931. France did the same, both before and after 1929. Strong and Moreau tried to reconcile two ultimately incompatible objectives: fixed exchange rates and internal price stability. Thanks to the level at which Britain returned to gold in 1925, the U.S. dollar was undervalued, and thanks to the level at which France returned to gold at the end of 1926, so was the French franc. Both countries as a result experienced substantial gold inflows. Gold-standard rules called for letting the stock of money rise in response to the gold inflows and for price inflation in the U.S. and France, and deflation in Britain, to end the over-and under-valuations. But both Strong and Moreau were determined to preven t inflation and accordingly both sterilized the gold inflows, preventing them from providing the required increase in the quantity of money. The result was to drain the other central banks of the world of their gold reserves, so that they became excessively vulnerable to reserve drains. France’s contribution to this process was, I now realize, much greater than we treated it as being in our History. These two paragraphs are full of misconceptions; I will try to clarify and correct them. First Friedman refers to “the U.S. shock to the international community.” What is he talking about? I don’t know. Is he talking about the crash of 1929, which he dismissed as being of little consequence for the subsequent course of the Great Depression, whose importance in Friedman’s view was certainly far less than that of the failure of the Bank of United States? 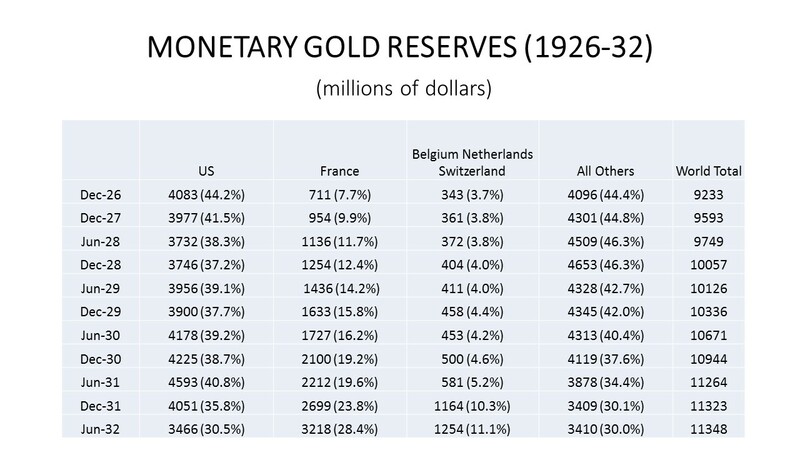 But from December 1926 to December 1929, total monetary gold holdings in the world increased by about $1 billion; while US gold holdings declined by nearly $200 million, French holdings increased by $922 million over 90% of the increase in total world official gold reserves. So for Friedman to have even suggested that the shock to the system came from the US and not from France is simply astonishing. Friedman’s discussion of sterilization lacks any coherent theoretical foundation, because, working with the most naïve version of the price-specie-flow mechanism, he imagines that flows of gold are entirely passive, and that the job of the monetary authority under a gold standard was to ensure that the domestic money stock would vary proportionately with the total stock of gold. But that view of the world ignores the possibility that the demand to hold money in any country could change. Thus, Friedman, in asserting that the US money stock moved perversely from 1929 to 1931, going down as the gold stock went up, misunderstands the dynamic operating in that period. The gold stock went up because, with the banking system faltering, the public was shifting their holdings of money balances from demand deposits to currency. Legal reserves were required against currency, but not against demand deposits, so the shift from deposits to currency necessitated an increase in gold reserves. To be sure the US increase in the demand for gold, driving up its value, was an amplifying factor in the worldwide deflation, but total US holdings of gold from December 1929 to December 1931 rose by $150 million compared with an increase of $1.06 billion in French holdings of gold over the same period. So the US contribution to world deflation at that stage of the Depression was small relative to that of France. Friedman is correct that fixed exchange rates and internal price stability are incompatible, but he contradicts himself a few sentences later by asserting that Strong and Moreau violated gold-standard rules in order to stabilize their domestic price levels, as if it were the gold-standard rules rather than market forces that would force domestic price levels into correspondence with a common international level. Friedman asserts that the US dollar was undervalued after 1925 because the British pound was overvalued, presuming with no apparent basis that the US balance of payments was determined entirely by its trade with Great Britain. As I observed above, the exchange rate is just one of the determinants of the direction and magnitude of gold flows under the gold standard, and, as also pointed out above, gold was generally flowing out of the US after 1926 until the ferocious tightening of Fed policy at the end of 1928 and in 1929 caused a sizable inflow of gold into the US in 1929. In thrall to the crude price-specie-flow fallacy, Friedman erroneously assumes that inflation rates under the gold standard are governed by the direction and size of gold flows, inflows being inflationary and outflows deflationary. That is just wrong; national inflation rates were governed by a common international price level in terms of gold (and any positive or negative inflation in terms of gold) and whether prices in the local currency were above or below their gold equivalents, market forces operating to equalize the prices of tradable goods. Domestic monetary policies, whether or not they conformed to supposed gold standard rules, had negligible effect on national inflation rates. If the pound was overvalued, there was deflationary pressure in Britain regardless of whether British monetary policy was tight or easy, and if the franc was undervalued there was inflationary pressure in France regardless of whether French monetary policy was tight or easy. Tightness or ease of monetary policy under the gold standard affects not the rate of inflation, but the rate at which the central bank gained or lost foreign exchange reserves. However, when, in the aggregate, central banks were tightening their policies, thereby tending to accumulate gold, the international gold market would come under pressure, driving up the value of gold relative goods, thereby causing deflationary pressure among all the gold standard countries. That is what happened in 1929, when the US started to accumulate gold even as the insane Bank of France was acting as a giant international vacuum cleaner sucking in gold from everywhere else in the world. Friedman, even as he was acknowledging that he had underestimated the importance of the Bank of France in the Monetary History, never figured this out. He was obsessed, instead with relatively trivial effects of overvaluation of the pound, and undervaluation of the franc and the dollar. Talk about missing the forest for the trees. Of course, Friedman was not alone in his cluelessness about the Bank of France. F. A. Hayek, with whom, apart from their common belief in the price-specie-flow fallacy, Friedman shared almost no opinions about monetary theory and policy, infamously defended the Bank of France in 1932. France did not prevent her monetary circulation from increasing by the very same amount as that of the gold inflow – and this alone is necessary for the gold standard to function. Thus, like Friedman, Hayek completely ignored the effect that the monumental accumulation of gold by the Bank of France had on the international value of gold. That Friedman accused the Bank of France of violating the “gold-standard rules” while Hayek denied the accusation simply shows, notwithstanding the citations by the Swedish Central Bank of the work that both did on the Great Depression when awarding them their Nobel Memorial Prizes, how far away they both were from an understanding of what was actually going on during that catastrophic period. In looking up some sources for my previous post on the gold-exchange standard, I checked, as I like to do from time to time, my old copy of The Theory of Money and Credit by Ludwig von Mises. Mises published The Theory of Money and Credit in 1912 (in German of course) when he was about 31 years old, a significant achievement. In 1924 he published a second enlarged edition addressing many issues that became relevant in the aftermath the World War and the attempts then underway to restore the gold standard. So one finds in the 1934 English translation of the 1924 German edition a whole section of Part III, chapter 6 devoted to the Gold-Exchange Standard. I noticed that I had dog-eared the section, which presumably means that when I first read the book I found the section interesting in some way, but I did not write any notes in the margin, so I am not sure what it was that I found interesting. I can’t even remember when I read the book, but there are many passages underlined throughout the book, so I am guessing that I did read it from cover to cover. Luckily, I wrote my name and the year (1971) in which I bought the book on the inside of the front cover, so I am also guessing that I read the book before I became aware of the Hawtrey Cassel explanation of the Great Depression. But it seems clear to me that whatever it was that I found interesting about the section on the gold-exchange standard, it didn’t make a lasting impression on me, because I don’t think that I ever reread that section until earlier this week. So let’s go through Mises’s discussion and see what we find. Wherever inflation has thrown the monetary system into confusion, the primary aim of currency policy has been to bring the printing presses to a standstill. Once that is done, once it has at last been learned that even the policy of raising the objective exchange-value of money has undesirable consequences, and once it is seen that the chief thing is to stabilize the value of money, then attempts are made to establish a gold-exchange standard as quickly as possible. This, for example, is what occurred in Austria at the end of 1922 and since then, at least for the time being, the dollar rate in that country has been fixed. But in existing circumstances, invariability of the dollar rate means invariability of the price of gold also. Thus Austria has a dollar-exchange standard and so, indirectly, a gold-exchange standard. That is the currency system that seems to be the immediate aim in Germany, Poland, Hungary, and many other European countries. Nowadays, European aspirations in the sphere of currency policy are limited to a return to the gold standard. This is quite understandable, for the gold standard previously functioned on the whole satisfactorily; it is true that it did not secure the unattainable ideal of a money with an invariable objective exchange value, but it did preserve the monetary system from the influence of governments and changing policies. Yet the gold-standard system was already undermined before the war. The first step was the abolition of the physical use of gold in individual payments and the accumulation of the stocks of gold in the vaults of the great banks-of-issue. The next step was the adoption of the practice by a series of States of holding the gold reserves of the central banks-of-issue (or the redemption funds that took their place), not in actual gold, but in various sorts of foreign claims to gold. Thus it came about that the greater part of the stock of gold that was used for monetary purposes was gradually accumulated in a few large banks-of-issue; and so these banks became the central reserve-banks of the world, as previously the central banks-of-issue had become central reserve-banks for individual countries. Mises is leaving out a lot here. Many countries were joining gold standard in the last quarter of the 19th century, when the gold standard became an international system. The countries adopting the gold standard did not have a gold coinage; for them to introduce a gold coinage, as Mises apparently would have been wanted, was then prohibitively costly. But gold reserves were still piling up in many central banks because of laws and regulations requiring central banks to hold gold reserves against banknotes. If gold coinages would have been introduced in addition to the gold gold reserves being accumulated as reserves against banknotes, the spread of gold standard through much of the world in the last quarter of the 19th century would have drastically accentuated the deflationary trends that marked most of the period from 1872 to 1896. The War did not create this development; it merely hastened it a little. Actually a lot. But we now come to the key passage. Neither has the development yet reached the stage when all the newly-produced gold that is not absorbed into industrial use flows to a single centre. The Bank of England and the central banks-of-issue of some other States still control large stocks of gold; there are still several of them that take up part of the annual output of gold. Yet fluctuations in the price of gold are nowadays essentially dependent on the policy followed by the Federal Reserve Board. If the United States did not absorb gold to the extent to which it does, the price of gold would fall and the gold-prices of commodities would rise. Since, so long as the dollar represents a fixed quantity of gold, the United States admits the surplus gold and surrenders commodities for gold to an unlimited extent, a rapid fall in the value of gold has hitherto been avoided. Mises’s explanation here is rather confused, because he neglects to point out that the extent to which gold was flowing into the Federal Reserve was a function, among other things, of the credit policy adopted by the Fed. The higher the interest rate, the more gold would flow into the Fed and, thus, the lower the international price level. Mises makes it sound as if there was a fixed demand for gold by the rest of the world and the US simply took whatever was left over. That was a remarkable misunderstanding on Mises’s part. But this policy of the United States, which involves considerable sacrifices, might one day be changed. Variations in the price of gold would then occur and this would be bound to give rise in other gold countries to the question of whether it would not be better in order to avoid further rises in prices to dissociate the currency standard from gold. Note the ambiguous use of the term “price of gold.” The nominal price of gold was fixed by convertibility, so what Mises meant was the real price of gold, with a fixed nominal price. It would have been less ambiguous if the term “value of gold” had been used here and in the rest of the passage instead of “price of gold.” I don’t know if Mises or his translator was at fault. Just as Sweden attempted for a time to raise the krone above its old gold parity by closing the Mint to gold, so other countries that are now still on the gold standard or intend to return to it might act similarly. This would mean a further drop in the price of gold and a further reduction of the usefulness of gold for monetary purposes. If we disregard the Asiatic demand for money, we might even now without undue exaggeration say that gold has ceased to be a commodity the fluctuations in the price of which are independent of government influence. Fluctuations in the price of gold are nowadays substantially dependent on the behaviour of one government, viz. that of the United States of America. All that could not have been foreseen in this result of a long process of development is the circumstance that the fluctuations in the price of gold should have become dependent upon the policy of one government only. That the United States should have achieved such an economic predominance over other countries as it now has, and that it alone of all the countries of great economic importance should have retained the gold standard while the others (England, France, Germany, Russia, and the rest) have at least temporarily abandoned it – that is a consequence of what took place during the War. Yet the matter would not be essentially different if the price of gold was dependent not on the policy of the United States alone, but on those of four or five other governments as well. Those protagonists of the gold-exchange standard who have recommended it as a general monetary system and not merely as an expedient for poor countries, have overlooked this fact. They have not observed that the gold-exchange standard must at last mean depriving gold of that characteristic which is the most important from the point of view of monetary policy – its independence of government influence upon fluctuations in its value. The gold-exchange standard has not been recommended or adopted with the object of dethroning gold. All that Ricardo wanted was to reduce the cost of the monetary system. In many countries which from the last decade of the nineteenth century onward have wished to abandon the silver or credit-money standard, the gold-exchange standard rather than a gold standard with an actual gold currency has been adopted in order to prevent the growth of a new demand for gold from causing a rise in its price and a fall in the gold-prices of commodities. But whatever the motives may have been by which the protagonists of the gold-exchange standard have been led, there can be no doubt concerning the results of its increasing popularity. If the gold-exchange standard is retained, the question must sooner or later arise as to whether it would not be better to substitute for it a credit-money standard whose fluctuations were more susceptible to control than those of gold. For if fluctuations in the price of gold are substantially dependent on political intervention, it is inconceivable why government policy should still be restricted at all and not given a free hand altogether, since the amount of this restriction is not enough to confine arbitrariness in price policy within narrow limits. The cost of additional gold for monetary purposes that is borne by the whole world might well be saved, for it no longer secures the result of making the monetary system independent of government intervention. If this complete government control is not desired, there remains one alternative only: an attempt must be made to get back from the gold-exchange standard to the actual use of gold again. Thus, we see that in 1924 none other than the legendary Ludwig von Mises was explaining that the value of gold had come to depend primarily on the policy decisions of the Federal Reserve and the other leading central banks. He also understood that a process of deflation could have terrible consequences if free-market forces were not operating to bring about an adjustment of market prices to the rising value of gold. Recognizing the potentially disastrous consequences of a scramble for gold by the world’s central banks as they rejoined the gold standard, Hawtrey and Cassel called for central-bank cooperation to limit the increase in the demand for gold and to keep the value of gold stable. In 1924, at any rate, Mises, too, recognized that there could be a destabilizing deflationary increase in the demand for gold by central banks. But when the destabilizing deflationary increase actually started to happen in 1927 when the Bank of France began cashing in its foreign-exchange reserves for gold, triggering similar demands by other central banks in the process of adopting the gold standard, the gold standard started collapsing under the weight of deflation. But, as far as I know, Mises never said a word about the relationship between gold demand and the Great Depression. Instead, in the mythology of Austrian business-cycle theory, it was all the fault of the demonic Benjamin Strong for reducing the Fed’s discount rate from 5% to 3.5% in 1927 (and back to only 4% in 1928) and of the duplicitous Montagu Norman for reducing Bank Rate from 5% to 4.5% in 1927-28 rather than follow the virtuous example of the Bank of France in abandoning the cursed abomination of the gold-exchange standard.